Mark your calendars! 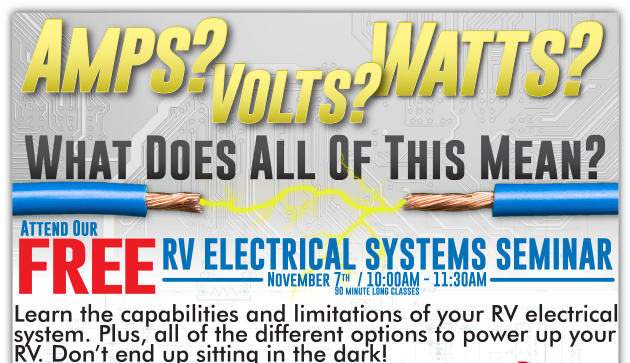 We’re hosting an RV electrical systems seminar on November 7th. If you’ve ever had questions about your RV’s electrical system that you want answers to, are looking to broaden your RV knowledge or simply want to hang out with some pretty awesome RVers, this is the event for your. And, the best part about it is that it is free! To ensure you have the most options available to you this seminar is being held at our Bath location and our Rochester location. From 10:00am to 11:30am you have the chance to learn form our incredibly experienced team and get answers to any questions you have. From amps to volts to watts we will connect the dots and help you understand what they mean and how they apply to your RV. You’ll learn the ins and outs of your RV’s electrical system, including its capabilities and limitations. We’ll also discuss alternative options for powering up your unit. Save Hundreds with Our Limited Time RV Service Specials!